My dad came to visit last week. We gave him the grand tour of our new kitchen and spent some time baking together. It was nice having two ovens to work with, we accomplished so much more this visit:) My dad is the expert when it comes to baking. He is famous for his cinnamon roll recipe, everyone loves them. 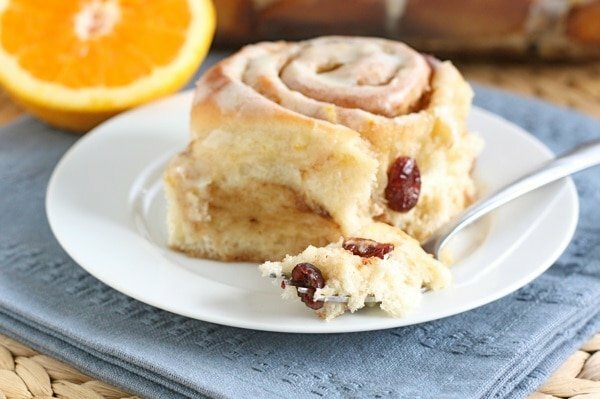 This time we did a spin on the traditional recipe and made cranberry orange cinnamon rolls. My dad loves raisins, so his cinnamon roll recipe always includes raisins. If someone doesn’t like them, he tells them to pick them out, but he will never omit them from the recipe. I was a little worried he wouldn’t want to swap dried cranberries for the raisins, but he was a good sport:) I made sure he knew I wasn’t trying to replace his beloved cinnamon roll recipe, I just wanted to mix things up for fun. It was a chilly day so we used the “proof” setting on our Thermador oven and it worked wonders with our dough. It rose right up for the occasion. 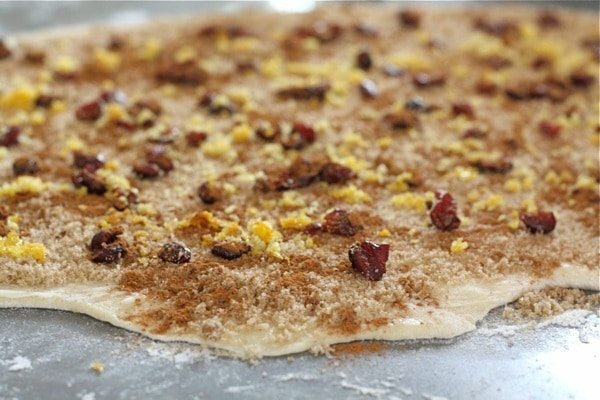 My dad rolled out the dough and we spread it with butter, brown sugar, cinnamon, dried cranberries, and orange zest mixed with sugar. We tightly rolled up the dough into one large log and cut the rolls with a piece of thread. My dad has always cut them this way, much better than a knife. We dipped and twisted the rolls into the orange sugar mixture to enhance the orange flavor. After the rolls rose a second time we popped them in the oven and whipped up our orange frosting. The rolls turned out beautifully! We frosted the rolls and served them while they were still warm. The satin dough melts in your mouth-it is the best. The cranberries and orange flavor were delightful, especially with the sweet orange frosting. 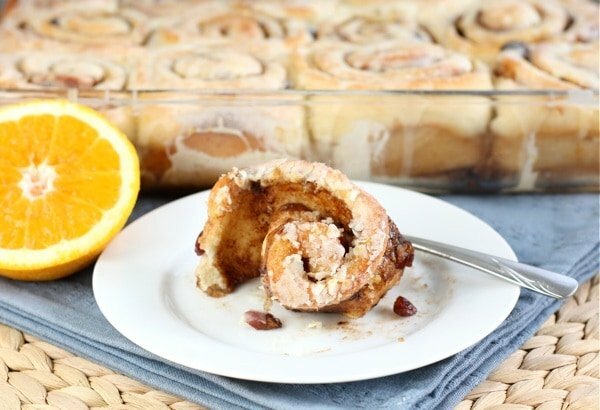 These cranberry orange rolls are perfect for the holidays. Make a batch for breakfast or brunch and invite your family and friends over. These rolls are too good not to share. *The winner of the Tortilla Land giveaway is Pam who said: “I love tostadas! Great combination of flavors and textures… yum!” Congratulations! We will email you! 5. Remove dough from bowl and place on a lightly floured counter. Divide dough in half. With a rolling pin, roll one half of the dough into a rectangular shape. Spread dough evenly with 4 tablespoons of softened butter. Sprinkle dough with 1/2 cup brown sugar, 3/4 cup dried cranberries, and 1/2 tablespoon cinnamon. Rub orange zest and granulated sugar together in small bowl. Sprinkle half of the mixture over the dough. 6. 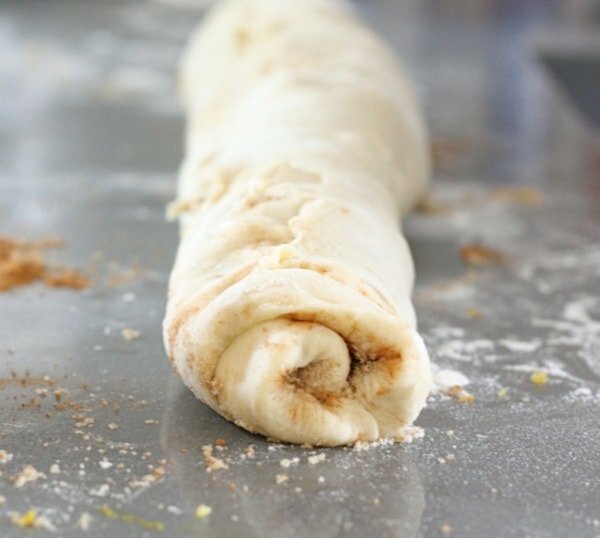 Gently roll up dough into one long roll. Cut rolls, using a piece of dental floss or thread, about two inches thick. Rub the zest of one orange and half cup of sugar together in a small bowl. Dip and twist the rolls into the orange sugar mixture. Place rolls in greased 9X13 baking pans.Now follow the exact same steps with the other half of the dough. 7. 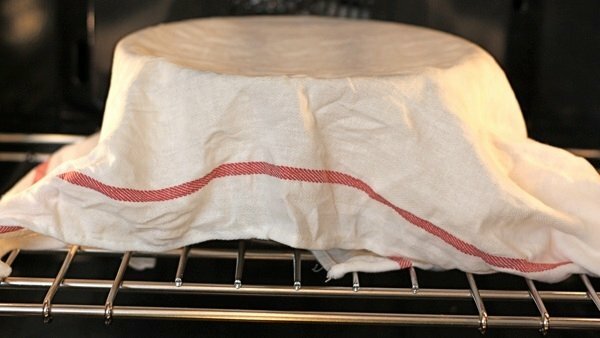 Place rolls in a warm spot and cover with a towel. Let rolls rise until double in bulk, about an hour. Bake rolls at 425 degrees F for 10 minutes. Reduce temperature to 350 degrees F and bake for 5-7 more minutes or until golden brown. Remove pans from oven and let cool on a wire rack for 5 minutes. 8. 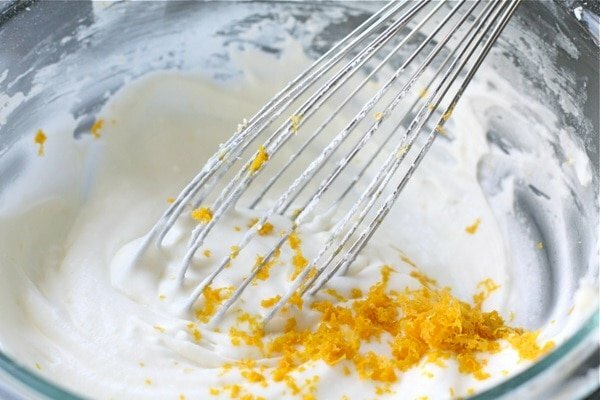 To make the frosting-in a medium bowl combine, butter, powdered sugar, milk, orange zest, and orange juice. Whisk until smooth. Frost the cranberry orange rolls generously with frosting. Serve warm. *Note-these rolls are best eaten warm. To reheat-microwave each roll for about 15 seconds. These look heavenly. I love your ingredient list…these are sure to be addictive! Nothin’ like a good cinnamon roll! What a nice visit with your dad, and a sweet one at that 🙂 Love the orange and cranberry in them! Looks delicious. I love cranberry orange scones too, those flavors together are the best! 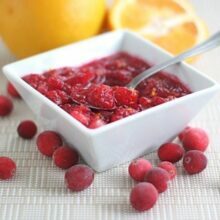 Cranberries and orange are a flavor-match made in Heaven! I used to make cinnamon rolls quite often, but have just fallen out of the habit. I need to correct that immediately with a batch of these. these look fabulous! i’ve yet to try making my own cinnamon rolls, but these look so temping, there is no way i can hold back any longer! Maria, these look delicious! I wish I could eat today. These would be the first things that I would make. I think I ate way too much this weekend though. 🙂 Stomachache!! Your apple cinnamon loaf was well received by my neighbors who loved it. Such a delicious moist bread! Glad everyone liked the apple cinnamon bread! Beautiful and looking entirely to delish compared to my plain yogurt. 😉 Blessings! DROOL! Wow, these look incredible girl! I love orange and cranberries together. They seem to be a blend of Autumn, Thanksgiving, and Christmas. Your rolls look delicious. I wish I had one of these for breakfast. I love the center too. Thanks for the link love. Love love love the flavor combination in these beauties. They look awesome. Oh my word! Talk about tempting! We’re about to start on a remodel too, and I’ve been eyeing the Thermador appliances! It seems as though you love yours. 🙂 And – the cinnamon rolls look DELICIOUS!!!!! I’m a sucker for any excuse to eat cream cheese. Happy November, and have a great week! Good luck with your remodel. We love our Thermador appliances. Love them! If you have questions, just let me know! I love that you used orange zest everywhere! Yum. I’ll have to try these. Great photos, too! I am so exicted I won! I am also so excited to make these beauties! I love the cranberry/orange combinatiion. Nicely done! I feel like I would be able to taste the sunshine with these. They sound so refreshing together ! And oh, they are such lookers too. Very pretty indeed ! YUM! Call me when you make the next batch! Proof setting on your oven? Seriously? I’m SOOO jealous! The proof setting is amazing! So you live in SLC? Yay! They look gorgeous. I never would have thought to put the dried cranberries inside. You’re making me drool over here! I definitely need to learn to make cinnamon rolls, and when I finally decide to try, I will turn to this recipe. Thanks for sharing and always inspiring me! MMMM…I want one right now! I bet dad (and Josh) was one happy man!!! Love this! 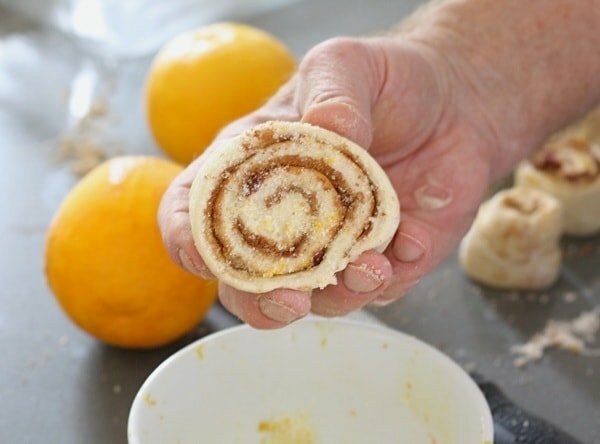 I’ve been searching for an orange roll recipe to try since a fond Christmas memory was eating the pillsbury orange rolls in the morning. I’ll have to give this a try sometime. Nice job and the addition of cranberries sounds perfect. I love craisins. Oh man–2 ovens–that sounds blissful! And the rolls look amazing, especially with the tang of the orange zest. Yum! We are loving our two ovens. Makes life so much easier! I know most people find cinnamon rolls daunting. Not I! And not you! These look FABULOUS! I have to say I love my cinnamon roll recipe – but these sound like a fun fall twist on the traditional. I love cranberries in almost anything. I made cranberry orange scones this weekend. 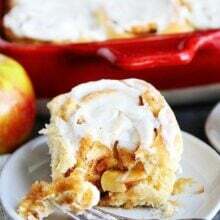 LOVE the combo…and of coursee I love cinnamon rolls…conclusion: I will be making THESE ASAP!!!! oh my goodness, this sounds like a really INCREDIBLE amped-up version of orange cinnamon rolls in a can…and i cannot wait to make them! These look beautiful! Good tip on cutting with thread, I’ll have to try that! I don’t know how you can make your dad’s rolls any better, but this is definitely a must try. 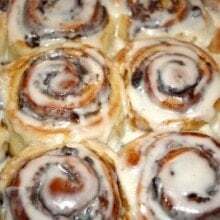 I learned to cut cinnamon rolls when I was raking home ec. in middle school years ago- It works great! I love experimenting with different kinds of cinnamon rolls. These look great! These are so pretty and I can only imagine how amazing they taste! I love the combo of orange and cranberry. These would be a great holiday breakfast! Those sound sooo good. Maybe next week when I’m not trying to stay away from treats. I ate way too much candy this past weekend. I want to try these and pumpkin cinnamon rolls. I fell in love with the cranberry/orange combination last year and still can’t get over how good it is. How fun that you got to cook with your dad! Delicious. I love that you dipped them in the orange sugar after they were rolled and cut. I worked at a bakery that was known for their cinnamon, orange and raspberry rolls…I think I shall make some soon! Your cinnamon rolls looks awesome, Maria! I was just thinking this morning that cinnamon rolls sounded really good. Maybe it’s the chillier weather making me crave a warm breakfast treat. These look incredible Maria! Cinnamon Rolls are my biggest weakness. These would be great on Christmas morning with the cranberries. They are now on my list to try. Oh my goodness, that looks like heaven! My mouth is seriously watering even thinking about it….mmmmm…. These look incredible!!! 🙂 So perfect to make the morning of Thanksgiving…if I can wait that long! These would be perfect for Thanksgiving morning! Enjoy! I’m LOL on the raisin issue. I’m the person who meticulously picks raisins out of my dessert. I’m cool with dried cranberries though. Glad Dad was too. Great photos…..your rolls look perfect! Oh, first your photos are so pretty (loving all that pretty light in them). Second, those rolls look divine!! I must try this recipe out on my family!! 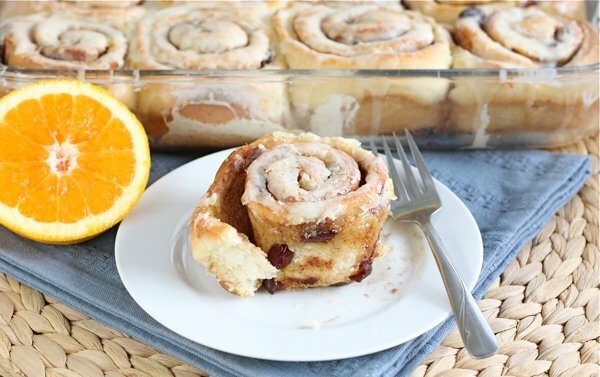 Mmmmmm – love the addition of cranberry and orange to cinnamon rolls. Yum!! 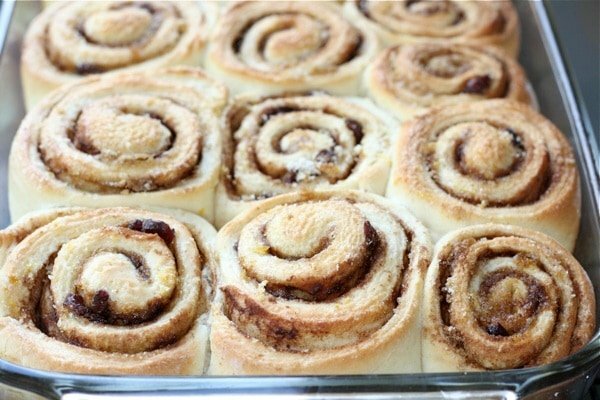 I have been craving cinnamon rolls lately and these look like they are amazing! Very nice twist! and your oven sounds really cool! I haven’t tried making them the night before, but I am sure you can. Just put them in the fridge after the second rise and bake them in the morning. Let me know if you try them! These cinnamon rolls would be the perfect breakfast treat on Thanksgiving morning! These look amazing! For those of us not in America, how much is in a package of yeast? Oh no. I literally JUST finished off a dish of pumpkin cinnamon rolls and now you’re doing this to me?!?! I just bookmarked these because I know I’m going to have to make them. They look absolutely amazing! These look fantastic. I am a sucker for an orange/cranberry combo in any baked good! this looks amazing! perfect for fall! thanks for the recipe! love the extra step of dipping the rolls in the sugar mixture. I can’t wait to try these sometime! These looks fantastic, Maria! Kudos to you and your dad. I am a tad bit envious of that proof setting on your oven. Those are beautiful rolls! I’m going to have to borrow your idea of dipping them in orange sugar before baking. Hi thanks for this fabulous recipe. I’m gonna try making them. Can I just confirm what kind of yeast u used? Thanks! We used Fleischmann’s Active Dry Yeast. I made a batch of these for my family this morning. I followed your recipe to the letter and they turned out PERFECTLY! They were soft, delicious, gorgeous and perfect. Thanks to you and your Dad for the recipe. They will be my go-to cinnamon roll recipe from now on. I am so glad you enjoyed the cinnamon rolls. I will tell my dad-thanks! These cinnamon rolls are absolutely gorgeous! I would love to have one of these for breakfast tomorrow…or maybe even for dessert tonight! Have you ever frozen these? I’m looking for good make ahead recipes and these look fabulous. Any suggestions? I always love reading posts about you in the kitchen with your dad. It is amazing to me since I truly don’t think my dad knows where the dishwasher is, let alone how to work with dough. These look amazing! Those rolls sound fantastic. I love all things cranberry, especially around the holidays. Your photos look stunning, too! magnificent! these are so timely, maria, though they’d be a nice and refreshing change any time of year. I’ve never posted about a recipe before, but I just made these today- AMAZING! They were so delicious and moist. Thanks for the holiday treat! So glad you liked the rolls, thanks for letting us know! How many rolls did this make? It makes a little over 2 dozen rolls. Yea! those were good. I said “were”. They are all (all 24 of them) gone! I didn’t realize I’d get so many, and I had fun giving them away to family and friends. My husband’s new favorite cinnamon roll. These would be PERFECT for Christmas morning! I like the idea of adding orange too. Your dad sounds adorable! Thanks for posting this – my Mum and I made these for my Dad today for Father’s Day, they’re so delicious!! We made a few tweaks and notes for next time to the recipe. We found the water content in my dough was too high – so next time I will reduce the amount of hot water I put in because it took 10 cups of flour to make it less sticky!! We struggled a bit with using thread to cut it so ended up using a sharp knife instead…I guess it takes some practice! We did everything up just after the second rising and then used clingfilm to cover the pans and put a tea towel over it then put it in the fridge overnight. This morning we baked them (adjusting the baking times accordingly). For the frosting, ours turned out to be very orange coloured ans we added a dash of vanilla extract to counterbalance the overpowering orange taste. We kept some plain and frosted some and put some baked unfrosted ones in a freeze-able container in the freezer because this yielded 30 (some small some large) rolls for us! This was the first time either of us made bread/pastries and I’m really pleased how they turned out – the odd sizes and shapes gave them an artisan hand-made feel! delish!!!! making them this weekend!!! I’m three for three with recipes on this site. These cinnamon rolls were absolutely delicious!! They’re not sickeningly sweet either, which is nice. I did have to a quite a bit of flour to the dough while kneading, but after some time it came together beautifully. I was worried it wouldn’t for a while. But just keep kneading. Orange and cranberry is one of my favorite combinations! Putting this on my New Year’s Day menu. My favorite cookie recipe uses this combination. I found I had to use about 10 cups of flour total, and I am sure I followed the recipe to the tee for the dough. I did some as regular cinnamon rolls and some as orange cranberry rolls (not all of my family likes the orange cranberry combo) and oh boy, they were so yummy! 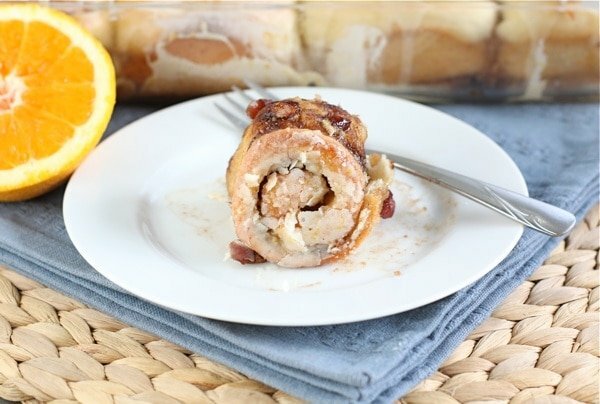 I loved the flavor of the orange cranberry rolls, and wished I had made more of those, even if it meant I would eat more of them. This recipe is a keeper. Thank you! Once these are rolled (not yet cut), can I freeze these to be thawed, cut, and baked? I was thinking of giving these as a gift for my mother in law that is going through chemo. It would be easy for her to thaw and bake. Thank you! Pingback: Cinnamon Roll Muffins are full of cinnamon goodness and no yeast is required! First let me say that these are delicious!! A couple teaks that I will try next time I make them; I believe there is way too much liquid in this recipe. I had to use about ten cups of flour and then divide the dough into two containers for the first rising, so I am going to eliminate 1 cup of water. I also used half of the orange zest throughout the recipe (per a comment in these replies) and the taste was perfect. I also didn’t use orange juice in the frosting figuring that the zest would be enough for the orange flavor and I was correct. The flavor of the combined cranberry and orange makes for the best rolls I’ve ever tasted. Now having said that it would be helpful for people to comment once they make the recipe! Out of 118 comments I found about 3 comments from people that were having the same problem I was. If you want to comment, “I want one!” don’t; you’re not being helpful. Thank you Maria and Josh for the best rolls I’ve ever made!